At the 2018 American Geophysical Union (AGU) Fall Meeting in Washington DC, I attended a two-hour sessions of talks by six speakers on the topic of Communicating Climate Change: Informing Politicians and Policy Makers. This topic is one where I have great interest, not only to improve my own communication skills, but in thinking of how to make my students realize the importance of sharing what they learn in my courses. Richard Alley (Penn State) titled his talk Telling the Good News, Too. As usual, his slides were filled with images of penguins (this is a strategy he uses, as audience members always like to look at penguins – therefore, they pay attention) but also great points for us to keep in mind. His overarching message, I believe, was the phrase he kept posting on his slides: Using our knowledge well really does help us. Among his graphics and demographic data (did you know that Philadelphia has three times more people than Wyoming? And the Philadelphia metro region has more people than North Dakota, South Dakota, Montana, Wyoming, Idaho, and Alaska combined? ), he reminded us that “the conversation changes when you frame it” and that we need to “speak in a solutions space.” See a snapshot of one of the slides from this presentation. Jerry Taylor (Niskanen Center) was the next speaker, that spoke with no slides (a refreshing change to hear just a talk where we could focus on the spoken word!). Titled The Relationship Between Climate Communication, Public Opinion, and Policy Change, he pointed out that the messenger is more important than the message, and that people will vote to match what they believe is best for the country. The last of the three speakers before the first panel was Anthony Leiserowitz (Yale Program on Climate Change Communication), speaking on Building Public and Political Will for Climate Action. I’m very familiar with the global warming opinion maps and the Six Americas survey, and even have students explore these data in class. So his talk was a great review – everyone should check out the work of this group! 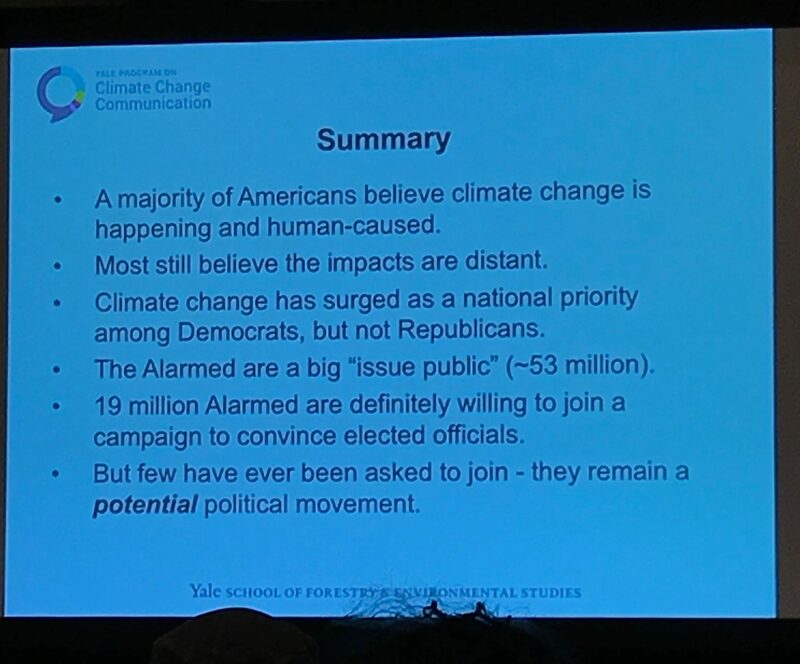 http://climatecommunication.yale.edu/ Below is a snapshot of his final slide, reminding us that we need to do a better job of asking the public if they want to be involved in advocacy efforts for climate. The first speaker for the second half of the session was Kathie Dello (Oregon State University), speaking on Communicating climate science to inform policy in Oregon. She reminded us that the states are more nimble than the federal government, that all climate is local (how we think and what we experience), and that we should connected on values, make it personal and conversational, and that our words matter. I also like how she emphasized social justice as a piece of the climate conversation. Next up was Kate Marvel (NASA Goddard Institute) with “I Don’t Believe in Climate Change” – Moving Beyond Political Polarization to Agreement on Actionable Science. Her take-home messages (what she termed “lessons”) were key: (1) beware of the extremes; (2) look for new stories; (3) confront the deep story; and (4) lift every voice – the most important voice is yours. These are all valuable points, and I do hope I can do my part to lift more voices and add my own to the chorus of those speaking for climate science.